Want To Sell Your Home? We Want To Buy It! We are experienced homebuyers looking for homes in your area. We're ready to make you a fast and fair cash offer and can close quickly. Get a fast, fair offer on your home, no matter what your situation. Complete the information on this page and we'll make you an offer and send your FREE report right away. We want to buy your house! We can make you a fair cash offer and close quickly. 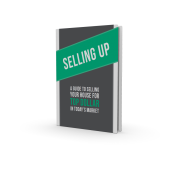 Immediate access to "SELLING UP: A Guide To Selling Your House For Top Dollar In Today's Market"
© SOAR Management Group LLC All Rights Reserved.